them and publish it here ! 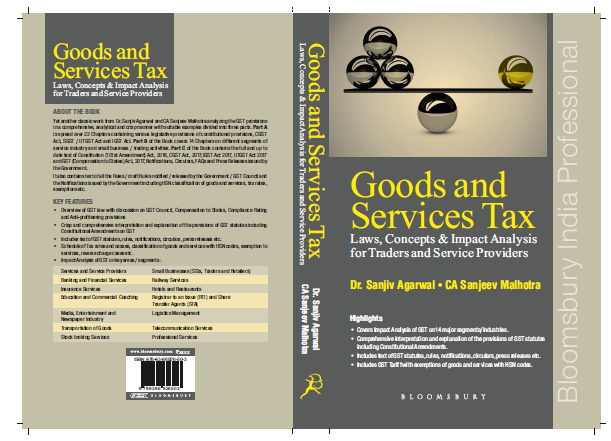 Yet another classic work from Dr. Sanjiv Agarwal and CA Sanjeev Malhotra analyzing the GST provisions in a comprehensive, analytical and crisp manner with suitable examples divided into three parts. This Book is divided into three parts. Part A is spread over 22 Chapters containing various legislative provisions of constitutional provisions, CGST Act, SGST / UTGST Act and IGST Act. More particularly, it explains the legal provisions on charge of GST, meaning and scope of supply including valuation, time and place of supply, registration, payments, return, refunds, invoicing, input tax credit, transition provisions etc. It also has specific Chapters on job work, e-commerce and transition to GST. Part B of the Book comprises of 14 Chapters encompassing wide spectrum of segments of service industry and small business / trading activities. Part C of the Book contains the full and up to date text of Constitution (101st Amendment) Act, 2016, CGST Act, 2017, IGST Act 2017, UTGST Act 2017 and GST (Compensation to States) Act, 2017. It also contains text of all the Rules / draft Rules notified / released upto 18th July, 2017 by the Government / GST Council and the Notifications / Circulars / Press Releases / issued by the Government including HSN classification of goods and services, schedule of tax rates, exemptions, services under reverse charge mechanism etc. �	Includes text of GST statutes, rules, notifications, circulars, press releases etc. �	Schedule of Tax rates and cesses, classification of goods and services with HSN codes, exemption to services, reverse charge cases etc. It is hoped that the Book shall be found useful by professionals, tax payers, industry bodies and all other stakeholders in GST.